Real time clock with DS1302 is designed using Arduino Uno. The DS1302 is a trickle-charge timekeeping chip containing a real-time clock/calendar and 31 bytes of static RAM. It communicates with a microprocessor via a simple serial interface. The real-time clock/calendar provides seconds, minutes, hours, day, date, month, and year information. DS1302 requires only three wires to communicate with the clock/RAM: CE, I/O (data line), and SCLK (serial clock). It has dual power pins, one for primary and another for backup. In this example the Primary power will be provided by the Arduino, and the back up by a CR2032 battery. During reading, the clock could rollover. That would result in bad clock data. To prevent that, the DS1302 has a buffer to store the clock data. That buffer can be read in a single communication session, called a “burst” mode. The Year data of the DS1302 is only two digits (0-99). The Year ‘0’ is 2000, and not 1970. It has a Leap-Year compensation from 2000 up to 2099 (for a value of 0-99).The data in this ram will get lost if the Arduino is off, and the battery gets empty. What is required to build the real time clock? The DS1302 can be easily connected to the Arduino. Three pins are needed for the interface (CE, I/O, SCLK), and Vcc2 should be connected to +5V (or +3.3V). The Vcc1 is for a battery . A crystal of 32.768kHz should be connected to X1 and X2. 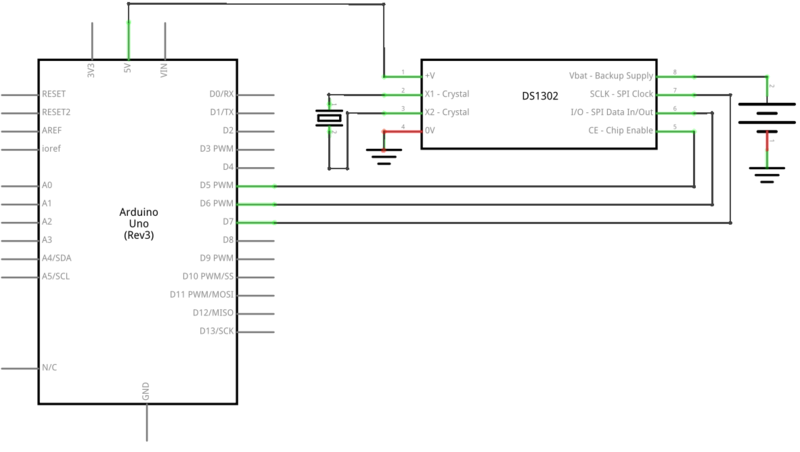 The DS1302 can run with a voltage from 2.0V to 5.5V. // assignments for the Arduino as well for as the DS1302 chip. // This need to be done first time to set the Date and time. // Thursday, July 6, 2017 at 22:58:50. 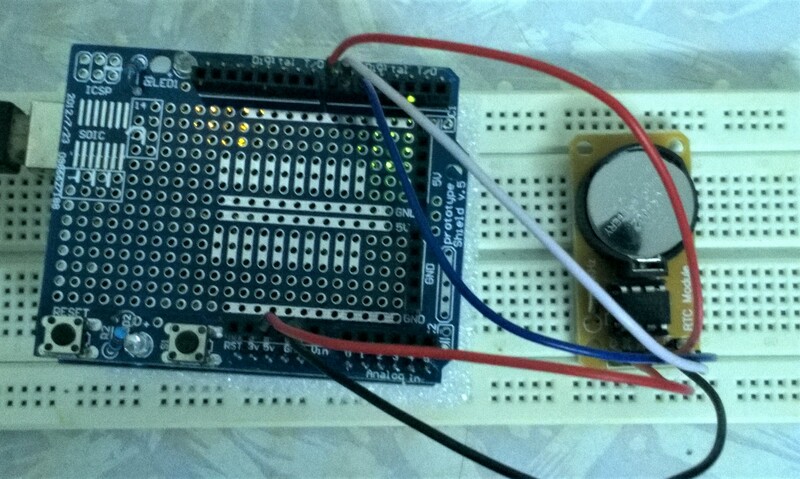 In the next Post I will modify this to make Alarm clock using LCD display.